Ok, for those of you that have already forgotten what the hand signals are. Here’s a little refresher. Now that I look closer at this picture, I’ve never used the Alternate Right signal…. Sorry, this bike is gone. You’ll get the frame, chain,fork with headset, and wheel set for free! I’m keeping the cranks. The bike is waaaay to big for me. I believe its a 60cm frame. It’s perfect for a Single speed or Fixie conversion. If you’re serious, please shoot me an email. HERE. That the Vice President of Marketing, Wayne D. Gray commutes on a KHS F20-R folding bike. I hear he lives pretty darn far too! This is Wayne riding one of their new “Green” bikes. Much respect due to Mr. Wanye D. Gray of KHS Bicycles! Now that’s what I call leading by example. Or should we say, riding by example! 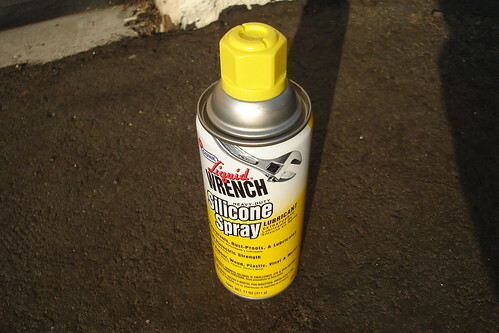 Apply Silicone Spray all over your drive train and especially on your chain rings. It will make your transitions from one gear to another rather smooth. But then again if you’re running a fixie, it wouldn’t really matter…aaaah what the heck, go on, treat your fixie drive train to some TLC! Val Kleitz from Seattle Bicycle Supply sent us some great info about the Shimano Dynamo Hubs. When we realized that we would be carrying the NuVinci CVT hubs at Seattle Bike Supply, we decided that we should offer a complementary front wheel. Since the best application of the NuVinci will be as a practical, solid commuting wheel, we tried to build up the most practical front commuting wheel to go with it. Here in the Pacific Northwest, we may not have much seriously cold weather to deal with, but the commuting conditions are otherwise fairly extreme in the winter. Rain, mud, and darkness are the rule rather than the exception. To cope with this, we chose one of Shimano’s Dynamo front hubs. Building a generator into the hub is not a new idea, even for Shimano. Many riders still remember the Sturmey Archer Dyno hubs that were made as early as 1936. As with any electric device, though, modern advances have improved these hubs drastically, so that today’s generator hubs are much more powerful than the early ones, though functionally identical. As the hub turns, a strong magnet built into the hub shell rotates around the core of the generator, producing current. There no more moving parts than a normal front hub, and the current produced becomes useful for lighting at around 3mph with a 700c wheel. It is a sign of the extreme practicality and increasing popularity of these hubs that there are at least five major companies offering them now. Shimano makes several models of Dynamo front hub, and we chose among them based on the conditions we expected them to endure. The DH3D30 hub is compatible with standard 6 bolt disc brakes, has 36 holes and a quick release axle. Disc brakes are extremely practical in wet conditions, offering consistent braking and lower maintenance than rim brakes, and 36 hole wheels will withstand much more abuse and need less truing than 32 or 28 hole versions, while weighing only slightly more. Once the hub is in a wheel, and the wheel on a bike, a light must me connected. Shimano makes one, which has both a white LED and a halogen bulb, and throws a well focused beam. In this area, though, there are many choices, and here, also, modern advances are worth pursuing. There are many new generator powered LED headlights that give superior illumination, and many of them also have the ability to remain on when the bike is stopped. For the NuVinci test bike, I used a very basic halogen headlight left over from another generator set. It is a well designed light from Union, and while there are better lights available, I found that this one provided much more than adequate light for dark bicycle trails. As with most lights of this type, its beam was not very noticeable when riding directly under street lights, but is definitely strong enough to catch the attention of drivers and to take over when the street lights are gone. The light I used also had no “standlight�? function, as many modern lights do. This function charges a capacitor while you ride, which then keeps the lights going for up to two minutes at a stop. I have ridden both with and without this function, and I find that, while I like it, it is not essential. If I am stopped, I am usually well out of the way of the traffic, and also usually directly under a street light. Otherwise, I am moving, and lit. Riding with a Dynamo hub can be very liberating. There is no friction between the tire and a drive wheel, as with frame mounted generators, and the resistance is almost impossible to notice when riding. I do have friends with Dynamo hubs who claim that they can tell whether their light is turned on or not based on feeling the added resistance, but even they admit that they may be imagining it (I think that they check under their mattresses for peas before going to bed, too). There is no need to wonder how much life is left in your battery, and no need to remember to plug anything in at the end of the ride. You can ride indefinitely without any dimming of the light, and you should not need to think about removing it from the bike when locked up outside the corner store, since the generator is the front hub, and the lights should be firmly bolted to the bike. All you have to do is ride, and know that you have light. The lighting system becomes an integral part of the bike, a standard feature, rather than something else to add on and worry about. A good light system based on a Dynamo front hub offers simplicity, reliability, and safety – exactly what every commuter needs.